Click Here To See Green Lantern #84 Comic Book! 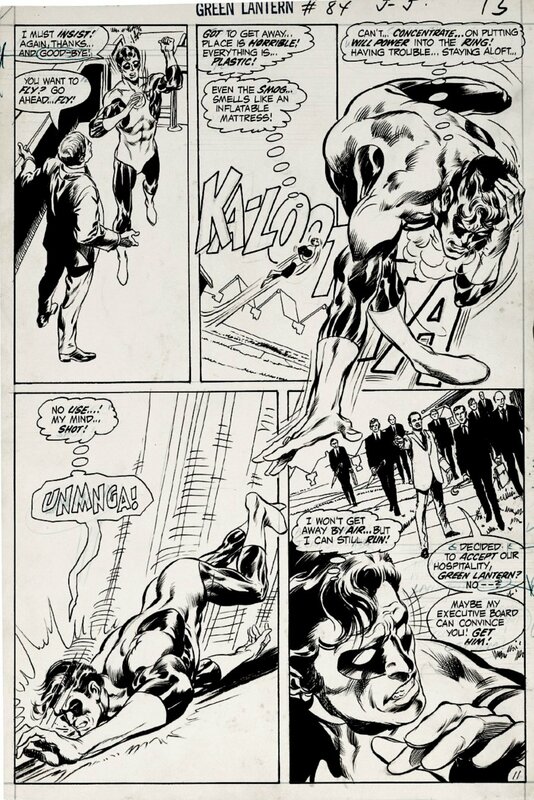 Check out this very nice SILVER AGE 1971 DC page, which was drawn by the 2 GREATEST DC ARTISTS OF THE 1970s, With pencils by the great Neal Adams, and inks by the incomparable Bernie Wrightson, from the story titled: "Peril in Plastic" This AWESOME page features 4 HUGE panels with great images of Green Lantern in EVERY PANEL! Green Lantern, After saving a town, is given a tour of the plastic factory. Weakened by gas emitted by the plastic pins produced there, he is unable to fight back against the villain of the story. 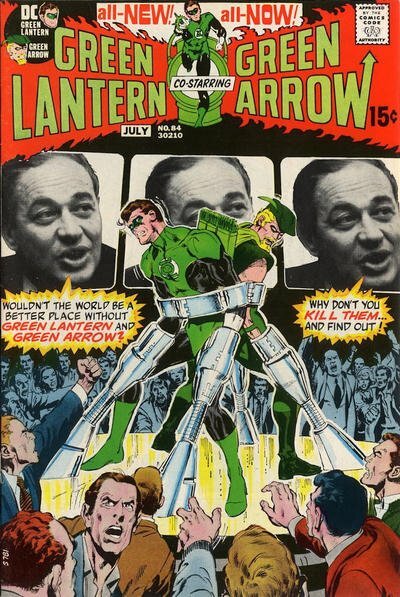 This very issue is one of the historic issues of the Denny O'Neil/Neal Adams run on this great title, as DC stories started to get "relevant" to the era that they were published in. An interesting side note, the plastic pin dispensing the goof-gas was named a "Kaluta". Both the name, and the fog-horn sound affect in the background ("Ka-Loooota") were a literal 'shout-out' to inker Bernie Wrightson's Studio-mate, Michael Kaluta. A marvelous page by Neal Adams at the top of his game. SILVER AGE DC Neal Adams AND Bernie Wrightson pages are VERY hard to find in the hobby these days, so don't miss out on this great GL page by these 2 icons of our hobby! ALL art on our website (including this one) are able to be purchased with VERY fair time payments, and trades are always considered towards "ANY" art on our website! Just send us an email to mikeburkey@aol.com and we can try to work something out.